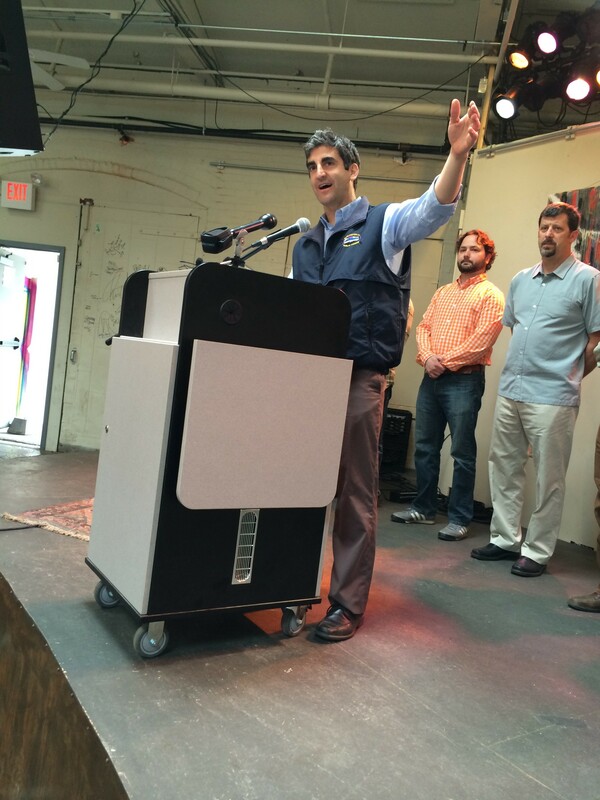 Mayor Miro Weinberger at ArtsRiot. Burlington Mayor Miro Weinberger spent much of Friday traversing the city using non-traditional transportation — via bike, shared van and electric vehicle. Dubbed the “multi-modal tour,” the annual event, now in its third year, showcases attributes that make the Queen City appealing to pedestrians and cyclists. It’s also a chance for the mayor to demonstrate his pedaling prowess — and for his support team to demonstrate its scheduling savvy. Within two and half hours, the mayor squeezed in eight stops, including two bagel shops, and made nearly 20 speeches about alternative transportation. The Twitter-friendly stunt kicked off when the mayor walked his daughter to school. It was, for the most part, an extended victory lap, during which Weinberger pointed out his successes in making the city more walkable, bike-able, bus-able and van-able. By his own admission, many of those advances have been “granular, ” but he described the cumulative effect as significant. Weinberger also invited Andy Vota, who lives and works in the South End, to testify to the value of the crosswalks, which incorporate flashing lights to warn motorists. Vota explained to the crowd that his “main qualification for coming to speak was that I almost was hit by a car” at an intersection on Pine Street. Vota is employed at the Vermont Energy Investment Corporation. At the final destination — ArtsRiot on Pine Street — Weinberger revealed what he described as a greater scheme. Looking slightly sportier than usual, with a vest over his dress shirt, he announced that his administration intends to launch a South End version of planBTV — the process that produced the blueprint now guiding development downtown and on the waterfront. AARP Vermont and Chittenden County Regional Planning Commission have agreed to help fund the public planning initiative. In the meantime, Chapin Spencer, director of the Department of Public Works, told the group about some more immediate, concrete improvements scheduled for South End streets. He pointed to new sidewalks being constructed on Flynn Avenue and Cliff Street and said his department's paving budget has been increased by 20 percent to address potholes and other impacts of a particularly tough winter. There are also corridor studies planned or underway to identify improvements for North Avenue, Pearl Street and North Winooski Avenue.